To get there took 24 hours of flight time and 8 hours of bouncing around in a four-wheel-drive truck, not to mention layovers. The trip began with an amazing (to me) MacGyver moment. When the airport shuttle driver came to pick us up and hoisted Anton's big backpack by just one strap, it promptly broke. Anton had the presence of mind to immediately run back in the house and fill a paper bag with nuts, washers, and bolts. On arrival at the airport, we sat down in a corner and pulled out our Leathermans (copyright?). Anton used these and the contents of his magical paper bag to effect an extremely sophisticated (again, to me) repair job. The broken strap is not only fixed, but vastly improved. Thus satisfied, we hopped on our 6-hour flight from San Francisco to Philadelphia. Sitting in the Philly airport, minding our bags while my husband hunted down a cheesesteak, I wrote: "It's so freeing to be on vacation, not thinking about my thesis, now or ever again! The feeling is elation, in fact. I love it. I can do anything. Right now I'm learning Malagasy--so fun to have a brand new language to play with! It's like a new toy!" Malagasy differentiates between two forms of first person plural: isaka 'we' includes the addressee while izahay 'we' excludes the addressee. My primary practical accomplishments, however, were limited to memorizing a "hello, sir" (manahoana, tompoko) and "thank you" (misoatra). We then had a 7-hour flight flight from Philadephia to Paris. My journal notes that I was "disconcerted by the spa atmosphere in the plane. Soothing music, slow motion grass waving on the screen, and a pungent odor of lavender wafting from the giggling middle-aged ladies behind us. Hee." In between giggles, the ladies apologized for having sprayed so much perfume, but I thought it was hilarious. The Paris airport was exhilerating--when we got through "Customs" (one laidback dude nodding at people) and rode a train to the next terminal, I got that familiar rush of adrenaline that only comes from being on foreign soil. But it drained away while we waited in line for security, a "line" that was more like a "mob." A mere preview of the Ivato airport in Madagascar . . .
Ivato is the airport of Antananarivo, the capital of Madagascar, henceforth abbreviated to Tana. Our flight from Paris was 10 hours. We had exit row seats, which meant there was lots of space in front of us, but to my surprise, once the flight got underway, passengers rose and congregated in the open space! They stood there chatting, asking flight attendants for drinks and snacks, and peering out the window. I was entranced by the social scene--totally different from American flights--nobody on the Air France flight seemed at all inclined to wait in their seats and push a call button. The lack of a "personal space" concept became less entrancing and more claustrophobia-enducing when we were crushed into a mob at Customs, a much more rigorous procedure in Tana than in Paris. A faded poster on one wall showing the remarkable wildlife of Madagascar was juxtaposed with another poster denouncing sexual tourism, a black and white photo of a young girl with sad eyes. Children are not souvenirs, it said. Saddened and squished, we finally made it through Customs, our passports bearing a new stamp that filled an entire page and had been partially filled in by hand. At this point I should mention that we were in Madagascar to visit these wonderful people, and Kirsten had made such excellent arrangements for us that we were basically carried through Madagascar, from Ivato to our final destination, Andavadoaka, by her planning. A taxi driver was waiting for us with a sign reading STAS ANTON. He helped us find the ATM (an American dollar is about 2,000 Malagasy ariary, and the largest bill is 10,000 ariary, and you can't pay for hardly anything with a credit card, so you very quickly get used to packing loads of cash) and waited while we bought a SIM card that totally worked in Anton's phone (as is the case in much of the developing world, cell phones are ubiquitous). The airport porters were very aggressive about wanting to carry our bags, for a tip of course, but Anton and I were quite firm and managed to avoid this service. For the most part, everyone we met was smiling and kind, seeming to enjoy my Manahoanas and Misoatras. The hotelier even responded to me with something incomprehensible, and when I couldn't answer, he laughed and said "I thought you spoke Malagasy!" It had been 37 hours since we rose from our bed at home, and it was heaven to lie down again. Even better to take a hot shower beforehand! Though I barely slept--we got in bed at almost 2 and I napped till 3, then was woken by voices and dogs barking and laid awake until we rose just after 4 to go back to the airport. Our final flight was 1 hour from Tana to Toliara, a city on the southwest coast of Madagascar. It was pleasant enough, though the view from the window was of a razed landscape, once-forested land that had been slashed and burned to make way for seemingly endless rice paddies. Yet how can you fault people for wanting to feed their children? settled in for the 8-hour drive. Sophie, Shawn, and Haja all work for Blue Ventures, the conservation organization that is also currently employing our friends Tom and Kirsten. Sophie is in charge of the octopus project (more on that later) and Shawn has been living in Madagascar for years, since he came over with Peace Corps, so we spent the drive pestering them both with questions about the country, the people, and the marine life. It was the fifth and final leg of our journey, and I think it was the best, but also the most grueling. The "road" was nothing but sand and rocks. The driver swerved all over to find the smoothest way, but the jarring bumps were simply unavoidable. At one point Shawn fell asleep, and I marveled that he could, but by the last hours of the trip I was so tired that I, too, dozed off. So why was it the best? It was our first real close-up view of the environment, and what an environment it is--we were driving through the Spiny Forest. Yes, that is a real thing. I used to think Dry Rainforest was my favorite kind of forest, but it has been supplanted. For the spiny forest has octopus trees (Didiereaceae, for maximum vowel usage! ), strange plants whose many arms are covered, not with the innocuous suckers of their namesake, but with cruel spines several inches long. 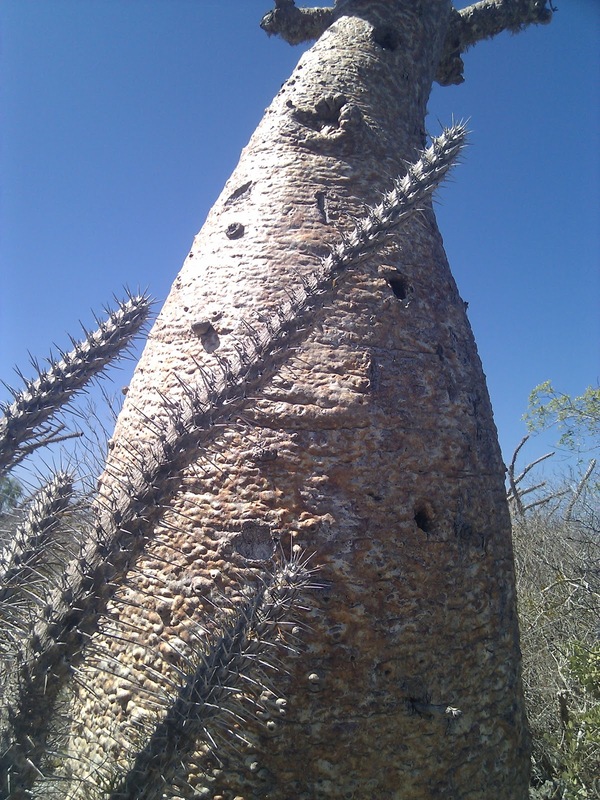 And the spiny forest has baobabs. 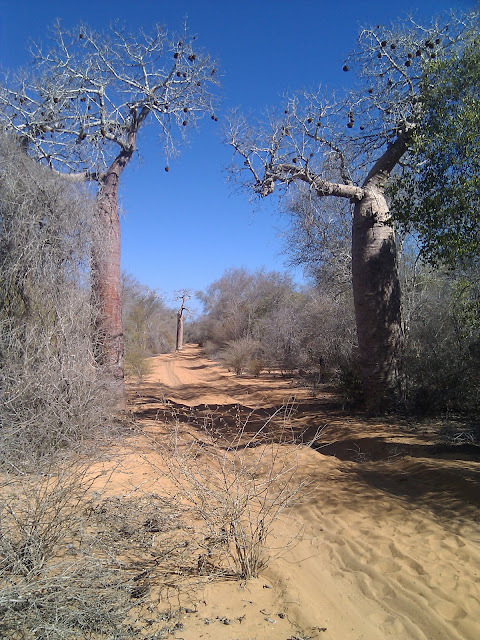 I am in love with baobabs. I first learned about them from The Little Prince, and I used to think they were fictional. They are real, yet fantastic. I am enthralled. This photo has three babobabs in it. It was the dry season, so there were few leaves, but those dark lumps in the branches are fruits. I had read that they were edible, a fact confirmed by Shawn, who actually stopped the driver and tried to bring down a fruit for me to taste by throwing sticks and rocks. No luck, but it was an amazing scene: the red sand, the afternoon sun on the weird plumpness of the trees, their bark peeling like a sunburn. Sophie found a fallen fruit that she thought was still good, so I smashed it against the tree trunk and tasted a tiny piece. Dry and tangy! And finally, we arrived in Andavadoaka. Such fun to sea Tom and Kirsten again! Such a gorgeous setting for the reunion! White sand and blue-green sea, whipped into whitecaps by a wind that blew hard for most of our visit. We stayed with the rest of the Blue Ventures folks in a local hotel called Coco Beach. 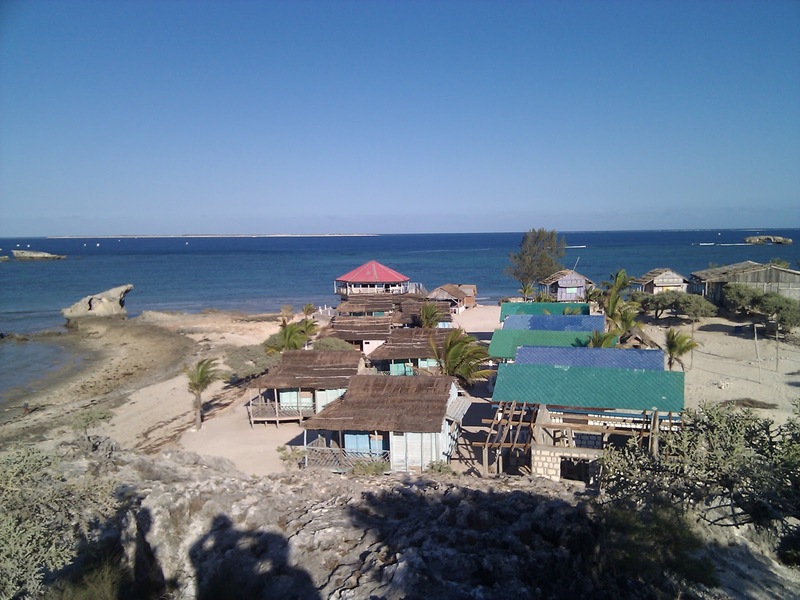 The rooms were freestanding cabins, some so close to the edge that they might be lost with the next cyclone. Each cabin had a shower and sink, and sometimes there was water pressure. We all shared a flush (!) toilet that lived in its own little building. A generator was turned on for several hours in the morning and several hours in the evening. When it turned off at nine o'clock, we would marvel at the stars for a little while (one night Tom pulled out his binoculars and we saw Jupiter's moons) and then go to bed. It was a pleasing schedule for me. The hotel seemed like almost impossible luxury in comparison with the nearby village. Such poverty, such subsistence living! They live in huts built of sticks that must constantly be repaired. They draw water from wells that have grown salty with seawater incursions--too salty for me to drink, but they live on it. The beach is their toilet. The children wave merrily and shout vazaha (foreigner) at us. Often it is vazaha cadeau? (they are used to French tourists that give presents) and we shake our heads and say tsi cadeau (no gift). But once I mesmerized a crowd of them by folding a volo (bird) out of paper. The smiles are beautiful. But although people can be enchanting, I must return to waxing lyrical over the spiny forest, the baobas, euphorbs and didiereaceae. The fat round-leaved succulents. 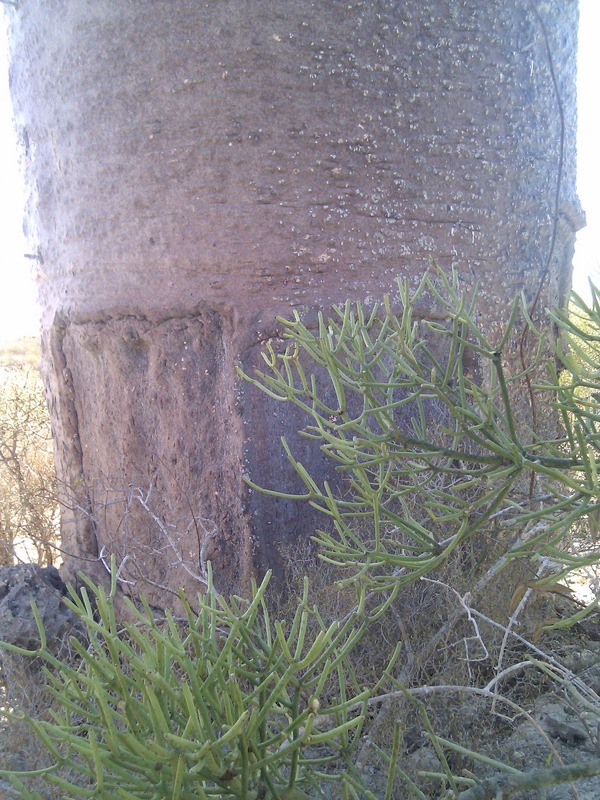 The caltrop burs and the tamarind trees! See how spiny it is? Euphorbs are all the fabulous succulents, like the one in the foreground of the photo of the hotel, above. Here is another. Cyanide can be extracted from this one for poison fishing. Fun! On our first morning in Andavadoaka, Tom and Kirsten took us for a walk across a salt pan (carpeted with the familiar Salicornia from California salt marshes) and through the nearby baobab forest. Tom says the Malagasy climb baobabs to pick the leaves, which is why we saw so many with holes cut into the sides, and sticks stuck into the holes to form a simple ladder. 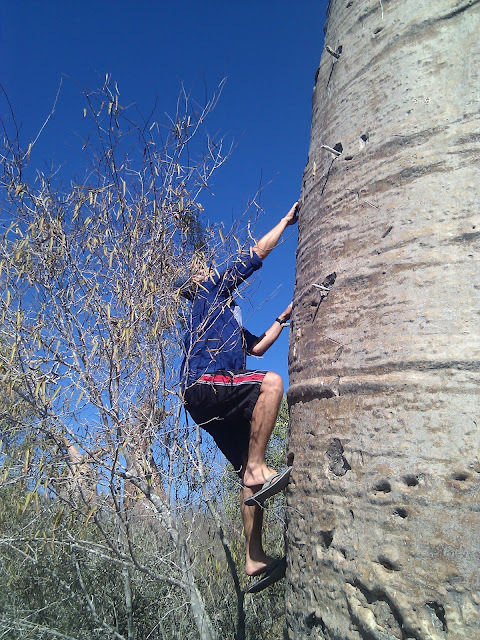 Tom tried to climb one, and I another, but the sticks broke and the holes crumbled and we couldn't make it up very far. This tree did not work so well for climbing. Also, flip-flops are probably a bad idea here. Then we came to a grand old tree with holes big enough to easily fit a hand or foot. Tom scampered up, and I followed, and for a little while we lounged in the crown of the tree. It was almost like a living room, furnitured with smooth, fat branches that I could hug, or sit on, or even sleep in. And what a view: baobabs poking their weird heads up from the spiny forest all around! I brought my camera, of course, and took panoramic shots, but unfortunately I cannot post these pictures at the moment. On our return flight from Toliara to Tana, my camera disappeared from my checked luggage. However, in a fantastic stroke of genius, we had shared our photos with Tom and Kirsten before we left Andavadoaka. So almost all of my pictures are safe on their computer, and as soon as they are back to a proper internet connection I will be able to ask them to send me copies. So that's all right! Sadly, our Leathermans (trademark, I guess? whatever!) also vanished during that flight. It is some comfort to know their last service was performed admirably in the San Francisco airport. Furthermore, the other backpack strap held strong for the rest of the trip, so no further surgery was required. Of course, I took fabulous photos documenting the SFO backpack surgery, but they are--yup, on my camera. Which is gone. So for the moment you'll have to take my word that it actually happened. In the meantime, I am using Anton's pictures to illustrate my travel writing, and the next entry will include some really lovely images of marine life. Because apparently MacGyver is also an underwater photographer. Oh, man, that's pretty. Spiny Forest. I shall need to remember that. Along with Dry Rainforest, with which I am unfamiliar. I have to say that "nuts, washers, and bolts" are not the items that immediately spring to mind when I think of repairing a broken backpack strap. I would tend to go for things like duct tape, needle, thread, and twine. But perhaps Anton's backpack strap is somewhat more... err... robotic than mine? Hahaha! Mike, Anton's backpack has an external frame, so he had to re-connect the strap to an aluminum rod. With the additional bolts, it looks very steampunky. I will definitely have to post my pictures when I get them back. Noah, I met dry rainforest in Australia. It is weird stuff! And Clint, thank you. I am definitely hoping to publish some of this--I'll keep you posted! Is "dry rainforest" supposed to be a link in that comment? It doesn't take me anywhere. Sounds like you had some Meetings with Remarkable Trees, like Thomas Pakenham, http://www.amazon.com/Meetings-Remarkable-Trees-Thomas-Pakenham/dp/0375752684. Thx Mike, I just figured out I can't use the anchor tag in comments. Fixed it now so it's just the url. What an adventure. We are living vicariously through your diary. Super cet aventure, cependant j'ai lu un article recament qui disait que la pluspars des gens qui utilise ce genre d'escalade se font grâve mal lorsqu'il tombe. Sympa ton aventure je te soutien mec ! je suis deriere toi ! Merci pour ce très bon article, je te soutiens carrement mon pote ! I hope you enjoyed your time here.